Continuing to explore the meat spectrum in a way that few major fast food chains have, Arby's introduces smoked beef short rib and Texas toast to the menu for a limited time and showcases them in the new Smokehouse Beef Short Rib Sandwich. 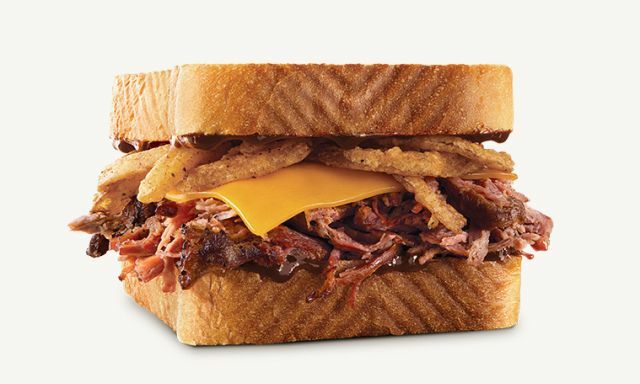 The Smokehouse Beef Short Rib Sandwich takes pulled beef short ribs that have been smoked at least six hours and serves it along with crispy-fried onions, cheddar, and BBQ sauce on Texas toast. For those with a bigger appetite, the chain offers up the new Smoke Mountain, which takes the Smokehouse Beef Short Rib Sandwich and makes it taller with the addition of pit smoked ham, and beef brisket. Short ribs are also featured in the new Smokehouse Beef Short Rib Loaded Curly Fries, which consists of the chain's signature curly fries topped with smoked beef short ribs, crispy-fried onions, shredded cheddar cheese, cheddar cheese sauce, and BBQ sauce. You can find all three items at participating Arby's restaurants for a limited time.